Like a lot of babies, Bronte would like to be shoeless, sockless (& probably naked) at all times. However, we do not live in the tropics & I'd like to protect her chubby little feet from the concrete, gravel, & whatever schmutz is on the sidewalks around here, so shoes it is. The only thing she can't usually get off is Robeez, which I love, but soft,thin suede soles just don't cut it here in Raincouver. 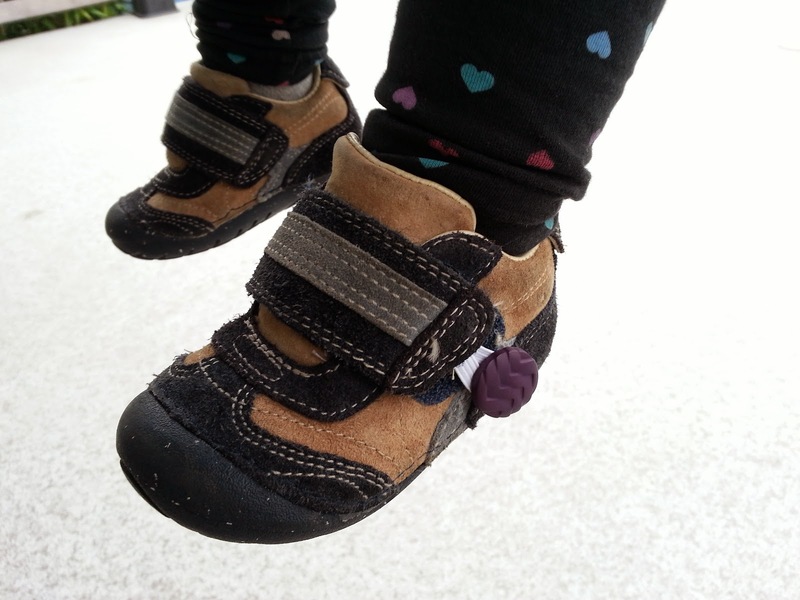 I found her an adorable pair of Stride Rites at our local kids consignment store (Wee Ones Reruns at Kingsway near Fraser) that are soft & flexible with a rubber sole that wraps up over the toe--perfect for that sometimes-crawling-sometimes-walking stage. Except she rips them off in seconds, because velcro cannot contain her. I let this problem sit in the back of my brain for a few weeks until I realized that she hasn't figured out buttons yet. Snaps, velcro, & zippers are no match for her, but buttons mystify Bronte. So I hacked her shoes to make them button closures. Nothing complicated enough for a tutorial. I just hand sewed a loop of thin elastic to the underside of each of the velcro straps, then stitched a button onto the shoe. If I do it again--I suspect I'll have to on her next pair--I'll make the elastic loops shorter, as these ones are a bit loose. They still work--I just need to loop them twice around the button to keep them really secure. All I needed was a needle, thread, two buttons, & four inches narrow elastic. 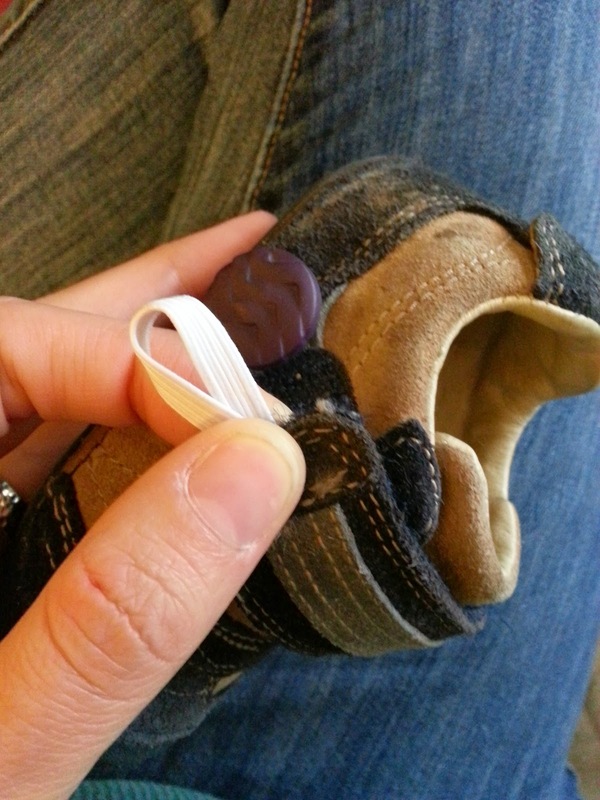 Total cost of this shoe hack: free, more or less. I had elastic & buttons lying around. If you bought two buttons & a packet elastic new, you might pay $3-4. Do your babies take their clothes off too? What solutions did you use to keep them dressed?